For decades, the Aquatic Kingdom known as Tethys was overlooked and ruled by King Delmar. The underwater temple was home to said king, as well as his daughter, Luna. The kingdom had lived in relative peace, at least until the king's daughter reached the age to marry. Men from land and sea were traveling to the kingdom to request the daughter's hand in marriage, and those that were rejected threatened violence upon the kingdom. Due to fear for his people, the king decided it was necessary to arrange a marriage for his daughter, with a merman born to another noble family. The two kingdoms were to join together upon their marriage, and the alliance would prevent unnecessary attacks from outside forces. The marriage would also show the power of the two kingdoms, and King Delmar knew it was the best thing for his kingdom, and for his daughter as well. However, Luna was extremely displeased when she discovered her father's plan. She didn't even hear it from the king first, and instead heard it from Rona, since the youngest girl could never keep her mouth shut. Luna shoved open the doors to her father's chambers, the mermaid clearly upset as she approached the surprised king. "An arranged marriage? You promised me that it would never come down to something like that. Not without talking to me, first!" the princess began speaking before the king could ask what the problem was, and the man's frown only deepened at her words. "Luna, I know you're unhappy but you don't even begin to understand how dangerous it is to have you without a husband. I can't wait long enough for you to choose someone yourself," the king explained to the girl with slight exasperation. "And, not to mention the benefits this marriage will have for you and the kingdom. It's well worth it in the end," the king tried to sway the girl, but her small scowl still remained. "The dangers can be handled easily, father. Our kingdom is well guarded, and it's not like someone is truly dumb enough to-" the princess started to argue once again, but was cut off my soft knocking at the door. "Come in," the king spoke up, turning his focus to the doors rather than his daughter. Last edited by lobo; 05-31-2018 at 05:40 AM. Some people say that people are not meant to fly. In the Empire, however, humans defied such conventional rules, building airships in order to sail the skies, or simply using levitation and flight magic in order to soar high above the world. People also say that humans are not meant to live underwater. But a certain Arcane Knight who specialized in aquatic combat simply figured that conventional rules were made to be broken. It wasn't easy... in fact it was extremely difficult.. to come up with the proper combination of martial and magical power to function underwater as a human. The first rule was that armor was heavy... it would cause a man to sink to the bottom of the ocean well enough, but getting back up was a problem. Some of the merfolk used light armor, but they also had powerful fins that could propel them through the underwater environment. And so the knight's armor had to be permanently enchanted with a Swift Swim effect... a type of Alteration magic that use a cinemantic force to allow the knight to swim as swiftly as a fish, despite the weight of the armor itself. The second problem, the inability for a human to breathe underwater, was solved by wearing an amulet of water breathing... more alteration magic, which allowed a man to breathe water as if it were air. These two problems solved the dilemma of movement and basic survival, but they didn't allow a human to communicate with the merfolk. Any sort of conventional speech would come out as a garbled mass of bubbles underwater, which was why the merfolk had their own language that used a series of sonic impulses similar to those used by dolphins and whales. The knight's helmet had been enchanted with a way to translate his speech into the sonic language, as well as to interpret the words that he heard. In this manner, he was finally able to act as a sort of emissary to the underwater kingdom of Tethys. Now standing before the throne room of King Delmar, he heard the knocking of the servant on the door before it opened. The sonic language of the king was translated into a language he could understand, and the knight made his way into the throne room... somehow swimming as swiftly as a fish despite his heavy armor. "King Delmar..." he spoke. "My name is Jason, and I'm here on behalf of the Empire." His gaze was drawn to the girl in the room as he spoke... an extremely beautiful, exotic creature. This must be the princess that he had heard of. "It's come to our attention that you'll be an ally of ours... soon..." He wasn't sure what passed for a bow among the merfolk, so he felt somewhat awkward. "So allow me to extend the hospitality of Emperor Friedrich I." Luna watched as the doors were pulled open, immediately surprised by what entered the room. She could tell it was a human, but the gadget that he was wearing caught her by surprise. She had seem humans before, obviously, but she had never had one travel as far as the underwater kingdom. It was usually the mermaids that were required to go up to land, if any sort of interaction between the two species needed to occur. It seemed a bit odd to her that the man could come all the way down to the kingdom, even with all his armor and everything. She was mesmerized to the point of not realizing she had been staring, until the knight looked to her, and their eyes met for a brief moment. The princess quickly averted her gaze, ducking her head down to avoid eye contact with the man. The king, however, didn't notice the silent interaction, and instead nodded his head to the knight. "I see. Well, thank you for the greeting, Jason. It's very rare that we have a human such as yourself coming all the way down to Tethys," Delmar seemed rather pleased though, and the king swam closer to the knight. However as the knight spoke again, Luna's eyes lifted quickly, the princess bristling. "No, we won't," she spoke before she could stop herself, swimming forward to place herself between the newcomer and her father. "This is just a bit misunderstanding. The decision isn't final, right?" she insisted, trying her best to plead her father with her gaze. The king only frowned at her interruption, the king shaking his head. "You'll have to excuse my daughter. She's...still adjusting to the thought of marriage, is all," the king apologized on Luna's behalf, motioning the young girl towards the doors. She managed to refrain from further arguing, and instead turned to swim past the knight and out the doors. Jason noticed the fact that the princess was staring at him, but didn't think much of it. After all, every mermaid that had seen him since he dived under the ocean surface had stared at him almost nonstop. He assumed, rightfully so perhaps, that they had simply never seen a human who could survive so deep under the ocean surface. Focusing on the words of the king, the knight gave a nod. "I imagine it's more than just rare..." he remarked. "But I appreciate the hospitality." He watched as the king swam closer to him. This was a very different sort of approach than a king in any human kingdom might provide... they tended to sit on their thrones acting regal and superior, but this Delmar somehow gave him the impression of someone more... he didn't know how to describe it. However, he didn't have much time to think of it as the princess immediately denied everything and said it was a misunderstanding. Curiously, he watched her swim off, returning his attention to the king. "She doesn't seem to have accepted the idea yet, it seems," the knight remarked. Young women did have a tendency to be quite stubborn at times, and judging by her appearance, Jason would guess her age to be somewhere between 15 and 18 by human reckoning, though as mermaids were a type of aquatic fae, she was likely much older in actual years due to the slower rate of aging of her kind. "Your servants have already prepared a place for me, so I'll be taking no more of your time, Majesty. Once again, thank you for your hospitality." He made an awkward bow that looked ridiculous underwater before swimming out of the throne room in the direction that Luna had went. The king stared off at the doors that his daughter left through, a slight frown still curled on his lips. Though he looked towards the knight as he spoke, and Delmar shook his head just the slightest. "She just doesn't fully understand it just yet. She'll warm up shortly," he insisted, though it was there their was a bit of doubt in his voice. Though he wanted to believe his daughter would do as he said, he also knew there was no way he could truly make her marry a man she didn't wish to marry. All he could do was press the importance of the marriage, and hope it was enough to get the young woman to realize the benefits it would have. King Delmar shook off his thoughts as Jason spoke again, and the king dipped his head just slightly. "Very well. Enjoy your stay," the man dismissed, watching as the knight swam off out of the room. He kept his gaze on the doors for another few moments, before finally returning to his throne. Luna had made it outside of the castle by now, finding perch on a sunken rock not far from the doors. She stretched out on the cool surface, her thoughts wandering to things ranging from her apparent arranged marriage, to the strange knight that had found a way to make it so deep beneath the water. She had so many questions that were being left unanswered, but it seemed as though she wouldn't be getting them from her father. The knight nodded at the king's words. Girls were often difficult at that age... especially when they didn't have a mother who properly raised them to accept the mantle of princesshood. He was of the impression that Delmar's wife had died while Luna was still young, and men had a tendency to spoil their daughters extensively as they couldn't resist the urge to let a cute little girl do as she pleased. It was typically the queen's job to ensure the proper education and preparation of a princess, after all. Making his way out of the castle, the knight noticed said princess perched on a rock not far away. Glancing around, he noticed that the guards didn't seem to be protecting her or discouraging her from accepting visitors... another difference, perhaps, from princesses in the Empire who were kept sheltered and away from strange men. With a shrug, he made his way closer to the princess, gazing at her and noticing just how incredibly beautiful she was. 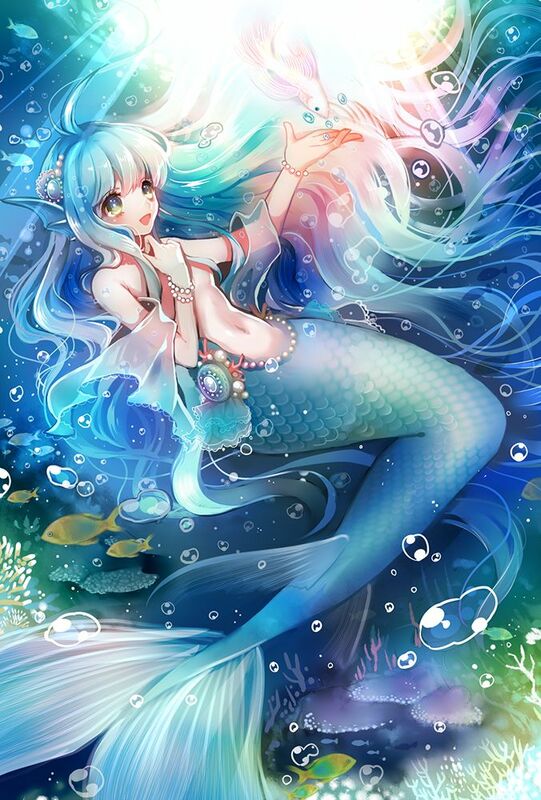 Mermaids weren't just half human fishes... they were fae creatures from the Nereid genus of water fairies. And like all fae, they were, in fact, incredibly beautiful from the perspective of a human. Eventually finding his words, the knight gave a polite nod of his head. "Highness," he said to her in order to provide some degree of respect and greeting. Luna's thoughts were interrupted by a voice, and the princess quickly turned her attention to the knight. She sat up a little straighter on the rock, clearly surprised to have been approached. "Ah... hello," she murmured after a moment. Her eyes had briefly locked with his, before they quickly moved to start looking over the man instead. She started at his helmet, eyeing the gadget curiously, before she moved on to looking at his amor. She had seen humans, and even some of the knights when she took trips on land. It just seemed odd to see one here, underwater, at her palace instead. "You're... underwater," the princess deadpanned, blurting out the obvious. She shook her head a little after she spoke, a hint of color ghosting across her cheeks. "I mean... you're here, easily. You can breathe and...talk. I'm just... confused. I'm sorry," she attempted to explain, her gaze falling now to look down at the rock she was seated on. However, before she could get much of an explanation from the knight, a voice caught her attention. "Luna!" Rona called to her older sister, approaching the two with Maren following close behind. They both slowed significantly when they caught sight of the unfamiliar man, but Rona still approached nonetheless. "Who is he?" she asked, swimming a half circle around Jason to get a better look at him. "You're not a merman," Rona added, blinking at Jason curiously. Gazing at the princess for awhile, Jason noted that Luna seemed to be almost as interested in his own appearance as he was in hers. He figured it was more a fascination with something she had never seen than any sort of actual attraction, however... while the mermaid's lower body was that of a fish, her upper body was indeed incredibly attractive. He gave her a nod as she pointed out some of the obvious facts, along with her confusion. Before long, two other cute mermaids showed to greet the princess... and show an interest in Jason's armor as well. "Ladies," he gave the two a greeting as well. "Indeed..." he said. He figured he should at least explain himself for the benefit of the princess and her friend. "In order to protect its vassals and allies, the Empire's Arcane University has made significant strides in the field of aquatic warfare. We can't protect anyone if we can't even survive underwater... so the basic essentials of survival were a high priority." Tapping his armor, he shrugged. "I suppose this is imbued with the latest advancements in the field of underwater magical enhancement." He began to turn, getting a good look at each of the girls. While it was true that the two noblewomen who had joined were quite beautiful as well... for some reason, he was more attracted to Luna. Which was probably not a good thing, considering the fact that she was engaged... or was she? From his impression, she had yet to accept the engagement, though he wasn't sure if she really had much of a choice. 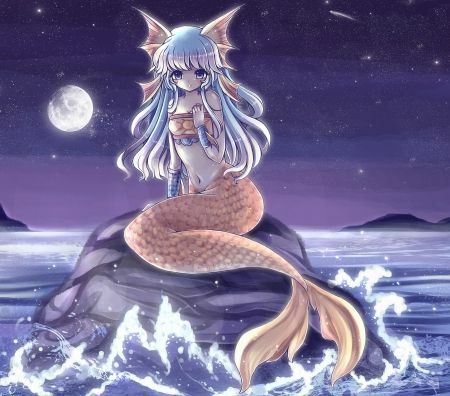 The two new girls joined Luna around the rock, and all three of them listened with obvious fascination as the man explained his armor and his ability to communicate with them underwater. "Woah... So you could basically live down here with no problem at all?" Rona was the first to actually speak, her eyes wide in awe. "Are you going to?" she added after a moment, clearly still curious about the situation. Luna, however, broke away from the group of three to approach Jason. She reached out to brush her fingers over the armor that he wore, then slowly swam a small circle around the man. Once she returned to the spot she had started, her focus turned to the helmet that he wore. "Is this... how you can talk with us?" she asked, reaching out to lightly tap the gadget. Her head was tilted just the slightly, clearly still attempting to figure out how the man was able to do everything that he could. Her gaze met the knight's once again, eyes filled with interest. It was quite baffling to have a man from the land be so far down in the ocean. "Are there going to be more people like you coming down here?" Rona spoke up again, drawing Luna's eyes away from the knight and to her friends instead. Maren nodded her agreement, a smile on both girls' lips. "More knights, like yourself?" she added, blinking at the man. If Jason hadn't known better, he might think that the three noblewomen were flirting with him. As it was, he figured they were mostly just interested in him for the equipment he wore. Thinking over the question that one of the nobles asked, the knight thought for a moment. "I might need to return to the surface from time to time for other reasons," he admitted. "But for the most part... I could survive down here for quite some time, yes. I don't know how long I'll be here, though... it depends." He was of the impression that Luna's engagement was far more certain than she made it out to be. Gazing at the princess as she approached him, the knight allowed her to tap the gadget on his helmet, giving her a nod. "I speak into the device in the Imperial language," he remarked, "And it translates my words into the sonic pulses used by your kind. Additionally, it translates your sonic pulses into the Imperial language so that I can understand you as well." When the other girl spoke up again... it almost seemed like she was looking forward to the idea of having more knights in Tethys, after all. Perhaps the two did have some sort of interest in human men. Likely they had heard stories... the sort of stories that painted knights out to be romantic heroes, most of which proved to be far from accurate, truth-wise. "It's... a possibility," he said. "I'm Jason, by the way... an Arcane Knight in service to the Emperor. I don't think I got your names."